A model of IDF’s tactical truck. This truck is fully operational today over at the Israeli Defense Forces. When I started looking for a model to build I wanted to build something the IDF uses, because I saw many other builders building vehicles their own countries use, so I wanted too ;). So I looked around a bit and found many old and rusty truck and the ATC 6×6- a new released tactical truck. When I looked into details I saw that the ATC company is based on Tatra, I found it funny building another tatra. But yet again I redesigned the mechanisms of the gearbox and some of the hubs and it performed great. As for the truck itself, from this experience I learned that the 6×6 transmission with 2 back axles and one front acts better than 2 front axles and one back. Also I think I managed to distribute the weight of the truck better over the axles. Because the cab and the steering motor were still too heavy for the front axle I had to put 2 shock absorbers for every wheel. Some more photos can be found HERE. The Instructions to build this model can be found in the Instructions tab at the bar up in this page. I saw your blog’s link put up by a friend on Facebook. Thank you for putting useful information on the net. It’s hard to come by these things nowadays. 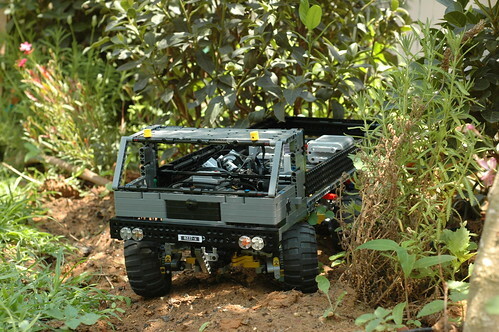 Now this truck is cool Im going to build it thanks for the instructions, love your blog..
Glad to hear that, thank you! I agree that truck is really awesome! It’s amazing that RC vehicles are so commonly used in the armed forces. It’s also neat to make scale versions like these. Where do i get the briks for this Trucks? I love the way this turned out. Well done. future. I want to encourage you continue your great work, have a nice weekend!